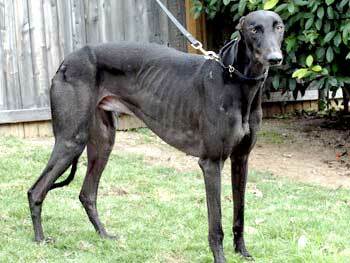 Nicky, aka Rapido Apex, is a 4-year-old black male, born on April 5, 2003. 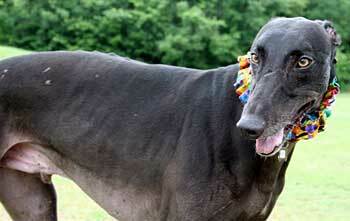 Nicky's sire is Rapido Marco, his dam is Rapido Ebony, and his sister is GALT alumnae member, Ariel. 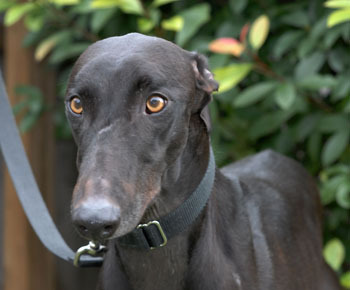 After deciding he didn't like racing, Nicky was adopted a couple of years ago. However, he was recently found running loose as a stray near the Texas/Oklahoma border; the whereabouts of his family are unknown. Life on the road left Nicky quite thin, but he is now putting on some much needed weight and he is ready to start campaigning for his true forever home. A bona-fide schmoozer, Nicky wants only to love and be loved, making his wishes known with those amber eyes that guarantee an ear rub or a chin scratch from everyone he meets. 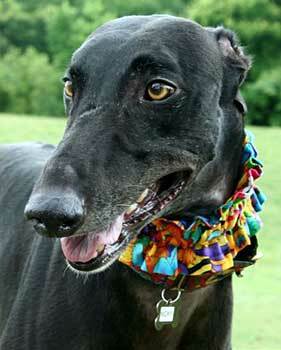 He is happily living in a foster home with other Greyhounds. Nicky is not cat tolerant, but appears to be small dog tolerant. Nicky is a very happy, energetic boy who is always up for a walk around the neighborhood. When meeting other dogs he is curious and playful but not aggressive at all and appears to be small dog tolerant. He gets along fine with our male grey and they don't squabble even though our grey can be quite the dominant boy. Nicky never raced but he likes to run "laps" around our back yard. It's entertaining to watch as Nicky zooms around the yard. Nicky has a very healthy appetite and has really filled out nicely since he has been with us. His coat has softened and is nice and shiny. Did I mention that Nicky can roo (sing) with the best of them! It is quite something to see and hear. All you have to do to get him started is start roooing (singing) yourself and the next thing you know he is right next to you trying to out roo you! And he will too! Although Nicky likes to roo, he is not too fond of loud music or noisy commotion so turning on the stereo will probably find him quietly getting up and going off to another room. Nicky loves being in a household with a canine buddy. He would like to have a forever home where there is another dog or dogs or where his people are around a lot. He's a true companion dog.